For lunch one afternoon at Terlato Wines HQ, I joined the table with my camera to photograph Chef Colin Crowley’s famous Saffron Farfalle. 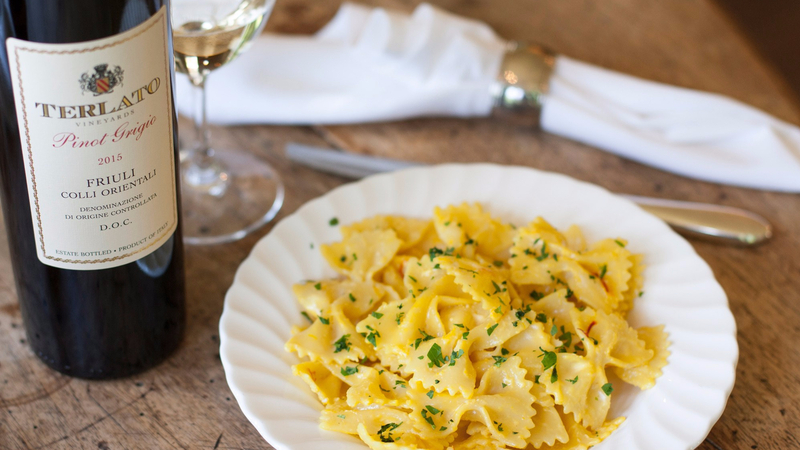 The meal was paired with Terlato Vineyard’s remarkable Pinot Grigio from Friuli. The two complement each other so well, I’ve haven’t experienced a pop from any other pinot. Although, I may be a bit partial. As with all meals here, it starts in the kitchen and I was able to snap a glowing shot of Chef. Lunch was a bit awkward at first, while everyone was gracefully chowing down, I was taking photos of my meal. We should have mentioned there would be a food paparazzi. I quickly put down the camera and joined the rest to indulge on this decadent pasta dish. I went back for seconds after everyone was finished to take my time giving the couple its closeup.